​Juventus manager Massimiliano Allegri insists that his side need to demonstrate more than just their natural ability and match their oppositions' physicality, following La Vecchia Signora's ​3-0 victory over Fiorentina at the Stadio Artemio Franchi. Rodrigo Bentancur opened the scoring in the first-half before two second-half goals from Giorgio Chiellini and Cristiano Ronaldo sealed all three points for the ​Bianconeri, who extended their lead at the top of the ​league to 11 points. Despite the margin of victory, Allegri believes that his side needed to show more intensity against their opponents. As quoted by ​Football Italia, the Italian told Sky Sports Italia: "This is a squad of great champions, great talents, but above all of great men. Technique alone is not enough, you need players who are open to chasing opponents down, of working for their teammates and going the extra yard. "You need the humility to work at the same rate physically as your opponents, then the technique can make the difference." 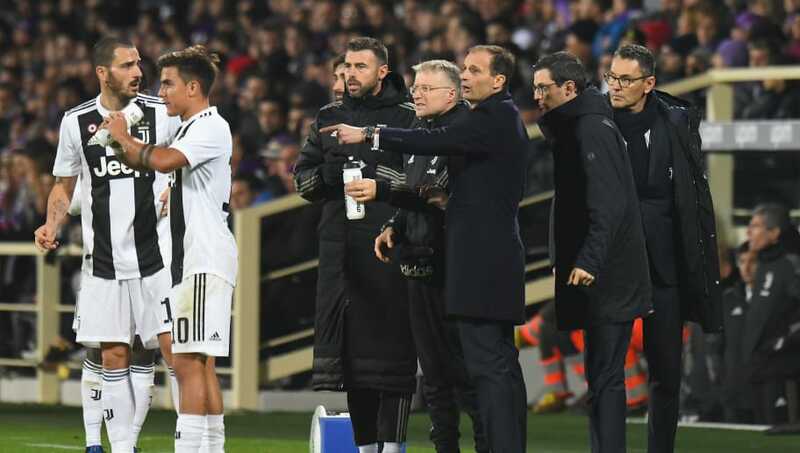 The reigning Serie A champions found it difficult to get the better of a compact Fiorentina side, who dominated them in the early stages of the first half, but Allegri suggested that Juve did well to adapt after spells of increased pressure. "It wasn’t easy, as the atmosphere was passionate and the whole city had been waiting for this game. I asked the lads to stay solid and after a period where we didn’t play all that well, allowing them to keep the ball for 10 minutes straight, we re-organised." Despite the lead, it was La Viola who looked a threat, with Federico Chiesa testing Wojciech Szczęsny on separate occasions. Yet the visitors weathered the storm and found their second through Chiellini, before ​Ronaldo added a third from the penalty-spot. "The second goal helped us shake off the tension and we relaxed into our lead. We had more chances and could certainly have gone 2-0 up earlier. "You have to be wary, as in Florence the games are never over until the final whistle, they have great technique and pace, but we defended well on their crosses."